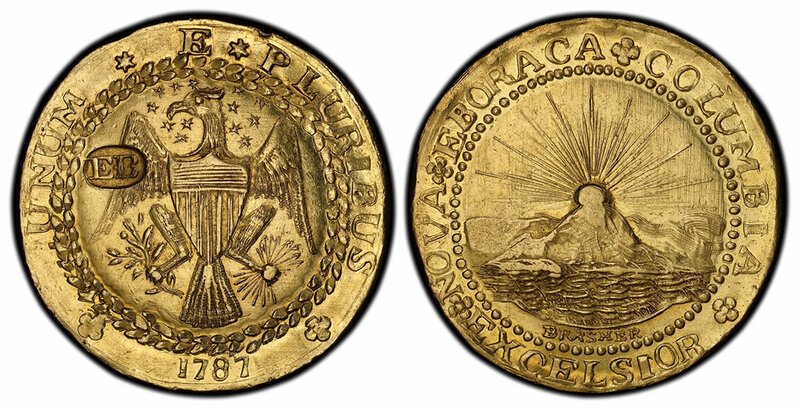 Eight historic early American coins, including a legendary 1787 gold Brasher Doubloon, will be exhibited by Professional Coin Grading Service (www.PCGS.com) at the next Long Beach Coin, Currency, Stamp and Sports Collectible Expo (www.LongBeachExpo.com) held Jan. 31 to Feb. 2, 2019. The discovery specimen for the legendary 1787 gold Brasher Doubloons will be displayed by PCGS along with historic New York copper coins at the Long Beach Expo, January 31-February 2, 2019. Photo credit: Professional Coin Grading Service (www.PCGS.com). This same exhibit was an enormous hit earlier this year at ANA’s 2018 World’s Fair of Money in Philadelphia. "The reaction from visitors to the exhibit at the PCGS booth in Philadelphia was more than just positive," said PCGS Set Registry® Manager Cosetta Robbins. "The PCGS staff could hear some of the visitors literally saying ‘Oooh!’ and ‘Ahh!’ as they viewed these superb, early American rarities." The Brasher Doubloon and seven of the finest known 1780s New York colonial era copper coins will be displayed together for the first time on the West Coast in an educational exhibit hosted by PCGS at the Long Beach Expo. The show will be in the Long Beach, California Convention Center at 100 S. Pine Avenue, and the exhibit will be at the PCGS Set Registry® booth #401. "The lettering and some design elements of all of these distinguished coins are punch linked, and each of these coins is an important part of early American history and numismatics," said Robbins. The Brasher Doubloons are the first gold coins made in the United States proposed or intended for circulation. The design includes the obverse motto, NOVA EBORACA COLUMBIA EXCELSIOR (translated as "New York and America ever upward"). Only seven Brasher Doubloons are known; six with the designer’s "EB" hallmark on the eagle’s wing, one with it on the eagle’s breast. The anonymous current owner of the Brasher Doubloon is described by PCGS as a "West Coast collector," and the owner of the New York copper coins is described as "a New York dealer and collector." 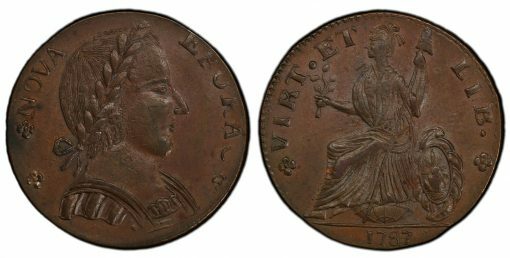 1786 Small Head Non Vi Virtute Vici ("Not by force, but by virtue we have won") with a portrait believed to be George Washington. Less than two dozen examples are known. 1787 Copper Nova Eborac ("New York"), Large Head variety, one of the finest of only a few dozen known. "The January-February 2019 Long Beach Expo will be an excellent opportunity for visitors to see and enjoy in person these impressive, early American rare coins," said Expo President Cassi East. Nothing ever happens in Michigan.